Love, Mrs. Mommy: Blogger Opp: 3 Winners! Obersee Kids Luggage w/ Integrated Cooler Giveaway! Winner's Choice - $240 TRV! Blogger Opp: 3 Winners! Obersee Kids Luggage w/ Integrated Cooler Giveaway! Winner's Choice - $240 TRV! Love, Mrs. Mommy is hosting a **3 WINNER** giveaway! 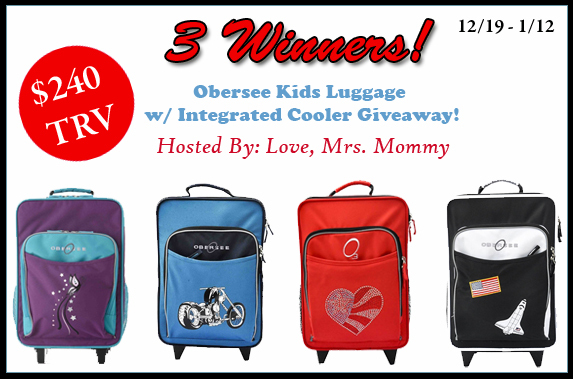 3 Winners will receive their choice of Obersee Kids Luggage with Integrated Cooler! Now your kids can travel in style with all their necessities & keep their snacks and drinks cool too! How fun! This is a $240 TRV Giveaway! I need your help promoting! There are FREE and Paid options available. I look forward to working with you! Thanks for your help! Co-Host Spots Available ~ $5.00 for 4 links of your choice (Facebook Comments, Blog Comments, Giveaway Entries, Daily Votes, Social Media Follows of your choice, and Secret Word Pages, but NO GOOGLE+) PLUS the 1 FREE link above gives you 5 Links Total!